Why Aglime Sunshine Coast? Construction in Australia means checking for Acid Sulphate Soils. The acidic properties of this type of soil can cause future toxicity runoff problems potentially harmful to surrounding land and waterways, drainage areas and even sewage. 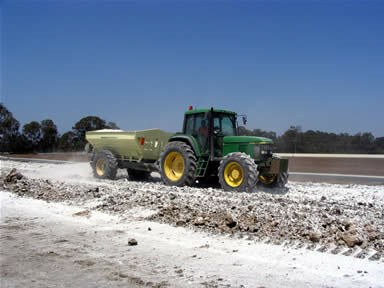 If the land you intend to build up or on has tested positive for Acid Sulphate Soil, Voight Contracting and Country Roads AG-Hire (with more than 20 years local experience) is the place to call for neutralising solutions. When to use Aglime? Sunshine Coast soil analysis specialists test all soil on proposed building sites in the planning stages of Queensland construction. Their results will determine if you have Acid Sulphate Soils, the depth of the soil affected and which kinds and the specific type of Aglime (agricultural limestone) mixture will be required to neutralise it. That’s when you call Voight Contracting and Country Roads AG-Hire and we will do the rest. The experts at Voight Contracting and Country Roads AG-Hire will work with your experts to create and execute a proper plan to neutralise the iron sulphides in the soil of your building site to prevent exposure to air (caused by ground disturbance from construction and rain runoff) which is when they become a toxic hazard to the environment. Aglime treatments of Sunshine Coast soils quickly raise the amounts of calcium and magnesium in the soil which then nullifies the iron sulphide content, making the ground more usable and environmentally friendly. Without treatment, ground disturbances and water runoff would release harmful components like iron sulphides, causing an acid raid effect highly disruptive to our natural ecology. Blue green algae is the most common result of Acid Sulphates soil runoff, ruining recreational waterways, sewage and drainage systems, rocking our aquatic communities and hampering our much-needed agriculture. Aglime treatments on the Sunshine Coast provide a positive outcome on an otherwise potentially negative impact and Voight Contracting and Country Roads AG-Hire has over 20 years experience in solving this problem head-on. If you need Aglime – you need Voight!